The global land and ocean temperature departure from average for October 2018 was the second highest for the month of October in the NOAA global temperature dataset record, which dates back to 1880. The year-to-date was fourth warmest on record. 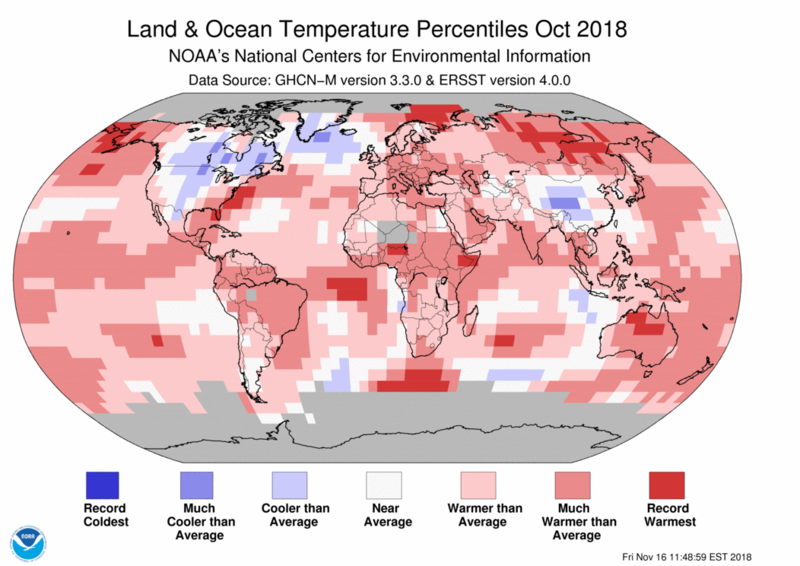 The October temperature across global land and ocean surfaces was 1.55°F above the 20th century average of 57.1°F – the second highest temperature for October in the 1880-2018 record. The record warm October temperature was set in 2015 at 1.78°F above average. October 2018 also marks the 42nd consecutive October and the 406th consecutive month with temperatures, at least nominally, above the 20th century average. The 10 warmest October global land and ocean surface temperatures have occurred since 2003, with the last five years (2014-2018) comprising the five warmest Octobers on record. 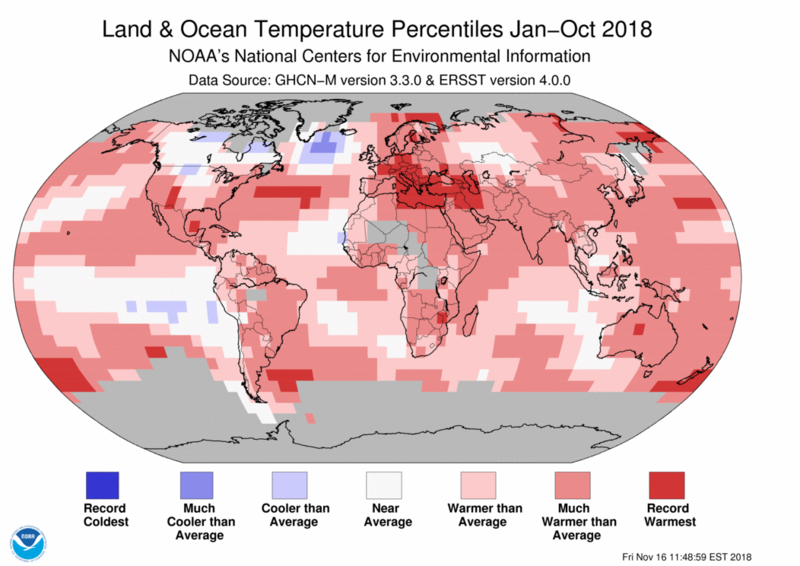 Record warm temperatures during the month were present across parts of the Atlantic and Indian oceans, Alaska, the Bering and Barents seas, central and eastern Russia, northern Australia, and central Africa. 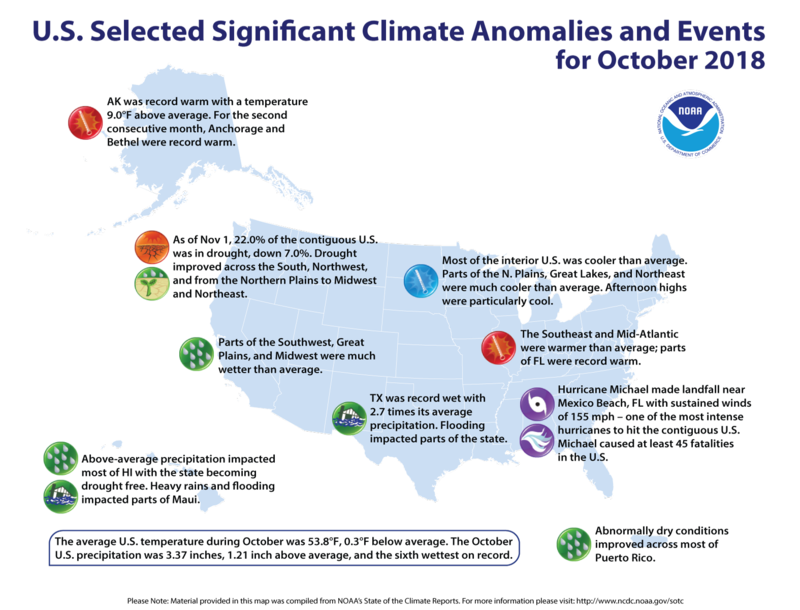 No land or ocean areas had record cold October temperatures. The October globally averaged land surface temperature was 2.23°F above the 20th century average of 48.7°F. This value was also the second highest October land temperature in the 139-year record, behind 2015 (+2.41°F). The most notable warm land temperatures were present across the Northern Hemisphere, specifically central and eastern Russia and Alaska, where temperatures were 9.0°F above average or higher. The most notable cool temperature departures from average during October were observed across much of Canada, parts of the contiguous U.S., and central China, with temperatures 1.8°F below average or less. On a continental level, Asia and Europe had their third warmest October on record. Meanwhile, North America’s October temperature was 0.13°F below average, marking the first time October temperatures were below average since 2009. The October globally averaged sea surface temperature was 1.30°F above the 20th century monthly average of 60.6°F – tying with 2016 as the second highest global ocean temperature for October in the record. The years 2014-2018 comprise the five warmest Octobers on record, with 2015 the warmest October at 1.57°F above average. The average Arctic sea ice extent for October was 884,000 square miles (27.4 percent) below the 1981-2010 average, according to analysis by the National Snow and Ice Data Center using data from NOAA and NASA. Sea ice extent was below average throughout large parts of the Arctic, particularly in the Beaufort, Chukchi, and Laptev seas. Overall, this was the third smallest October extent since records began in 1979. 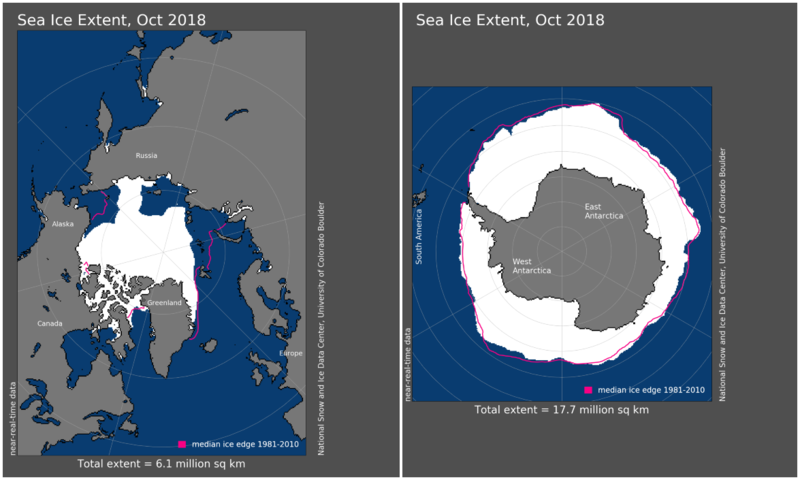 Antarctic sea ice extent during October 2018 was 170,000 square miles (2.4 percent) below the 1981-2010 average, the fourth smallest October value on record. On October 2, the Antarctic sea ice extent reached its annual maximum extent at 7.01 million square miles. This was the fourth smallest Antarctic sea ice extent maximum on record. According to data from NOAA and analyzed by the Rutgers Global Snow Lab, the Northern Hemisphere snow cover extent during October was 0.97 million square miles above the 1981-2010 average. This was the 14th largest October Northern Hemisphere snow cover extent in the 51-year period of record. The North American snow cover extent was the second largest on record, slightly smaller than 2002, while the Eurasian snow cover extent was the 22nd largest. The year-to-date temperature across global land and ocean surfaces was 1.39°F above the 20th century average of 57.4°F – the fourth highest for January-October in the 139-year record. The years 2014-2018 comprise the five warmest January-October periods on record, with 2016 the warmest such period at 1.76°F above average. The year-to-date globally averaged land surface temperature was 2.03°F above the 20th century average of 48.7°F. This value was also the fourth highest for January-October in the record. Europe had its warmest January-October since continental records began in 1910 at 3.31°F above average. This value exceeded the previous record set in 2014 by 0.23°F. South America, Africa, Asia and Oceania had a January-October temperature that ranked among the seven warmest such period on record. The year-to-date globally averaged sea surface temperature was 1.15°F above the 20th century average of 61.0°F. This value tied with 2014 as the fourth highest for January-October in the 1880-2018 record. For a more complete summary of climate conditions and events, see our October 2018 Global Climate Report.